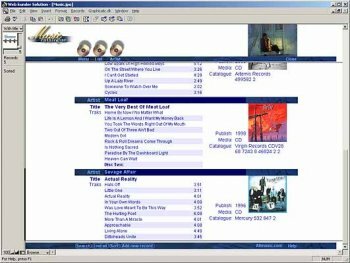 Music Catalogue makes it easy for you to manage all your records, cd`s, tapes and MP3`s in one database. The program make it easy to search and find the track or artist you are looking for. Find the album and see all the tracks on it or find all tracks with a specific word in the title. Sort your list as you would need them or make a print of your complete list of music or a track list of a specific album. The system makes it possible to insert a picture of the cover that you can find on the Internet or you have scanned yourself. You can insert collector informations as price, rating, style and much more. Include custom fields. You can insert a link to your MP3 files you have on the hard disk or cd`s. Click on the link in the program to play the files from there or right click and play the file with your default player. You can also insert different information about the artist or band including a picture. Se the list of records that the artist/band have released and when it was released - and with one click on your mouse you can read all information you have inserted about the record. You can go from one information sheet to another and you move easy and logical within Music Catalogue. No other solution makes it so fun and easy to handle all you information.